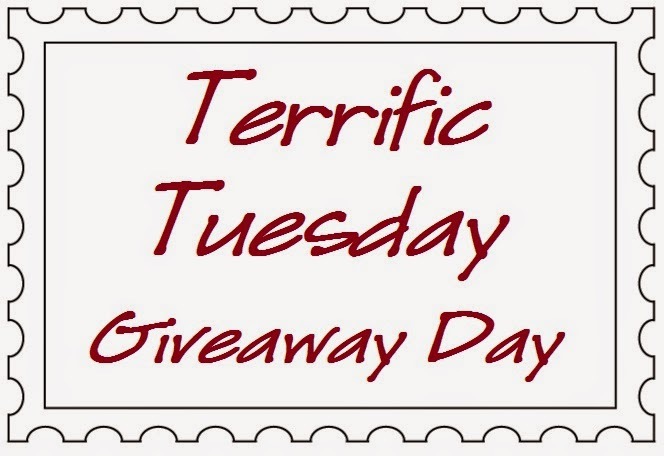 Today's Terrific Tuesday Giveaway is being sponsored by Four Peaches Fabric . Did you know that Wendy curates goregous handpicked collections called Peach Blossoms!! These are one of a kind bundles in Fat Quarters and Half Yards that are only available until they are sold out. And right now they are all 50% off!!! You are so going to want to Pop on over and these beautiful bundles out!!! And Today's Terrific Tuesday Giveaway is for one of those fun handpicked Peach Blossoms collections. 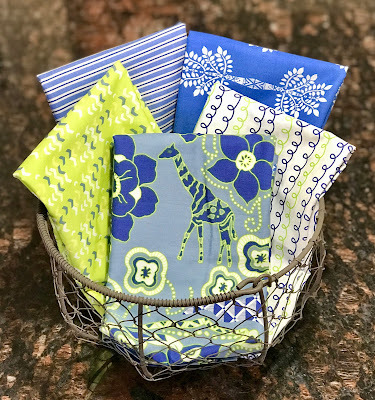 Four Peaches Fabric is giving one lucky reader a I've Got the Blues Fat Quarter Collection :) Such a pretty selection of fabrics!!!! I do some Happy Quilting. I would be really blue if I did nnot have this opportunity to try and win these lovely blues. 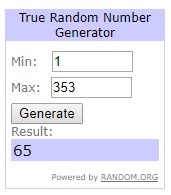 I love the color blue and thank you for the giveaway. Hard to pick one! I love orange you happy because it is so happy! I love to run my hands through the buttons in my button tins! They are very therapeutic to me! I tried to sign up for the newsletter but got error message. Oh well, will try later. Nap in the warm sunshine. Chocolate and sunshine help chase the blues away! And beautiful fabrics too! Getting outside for awhile really helps with the blues! I follow Four Peaches everywhere! I go find some fabrics to fondle! Or mindlessly stitch on a project until I feel better. I dance! No kidding, I turn up my favorite music and just let it take me away. Sometimes I have to put the songs on repeat, but they eventually do the trick. Our weather is saying rain and/or clouds for the next 10 days and I dare say, I'll be applying my prescription several times before the sun helps chase away the blues. I like to get my mind absorbed in a good book to forget about being blue. Time spent laughing with my family is also useful! I buy FABRIC, retail therapy at its finest. I follow Four Peaches on Instagram. I ignore the messy house and I SEW! Or lay in bed doing crossword puzzles. I visited the shop and am SO tempted by the Blushing Grey collection!! I start sewing small pieces of fabric together to make larger ones. I get so absorbed in that I have the blues just evaporate! I now follow four peaches on Pinterest. Quilting or reading always make me feel better. Love the Dreaming of Spring fabric collection. Get outside:) Soak up the beauty of the blue sky and soleil during daylight and the sunset and stars at nightfall. We have such a precious earth. Buying at least a little bit of fabric always cheers me up. A Little Sweetness fat qtr bundle in the shop is catching my eye. Thank you Four Peaches! I take my chihuahua for a walk and enjoy the world around me. Love the fabrics! I sleep. I know thats not good, but sometimes quilting dont help. Should go for a walk, but weathers not been right. oh such pretty fabrics. the colors of my kitchen. these would make a lovely runner. when I get the blues I like to sit and escape into a good book or sit and make greeting cards. I hang out with my family. They always make me feel better, especially my niece and nephews. Speaking of blue, i love the Blue Carolina fat quarter bundle that they have on the website. I take a hot bath and read a good book when I have the blues. Ice Cream...that's how I cheer myself up when I have the blues! That and quilting. I visited the wonderful shop (that 50% off sale is amazing!) and signed up for the newsletter. Thanks for letting me know about them. Wonderful shop! I think the "Orange You Glad" bundle is cheery and charming and I could certainly make room for it in my stash. I love this bundle - and I rarely get the blues, but if I do, I like to sleep it off. When I get the blues. Which happens often in the winter. I go outside. Even if it is gray and cloudy enough sun gets through to raise my spirits. I go to my craft / sewing room! I signed up for Four Peaches Fabric's newsletter. Oh my goodness... Four Peaches is wonderful! I bought a couple of lovely bundles because I cannot resist aqua and red or the aqua and oranges. Plus I have joined her FB page. What lovely goodies she has! And the prices were extraordinary! Sadly, many of Four Peaches' bundles are sold out. Great sets, though. I'm afraid my cheer-up is not very productive, either ice cream (it's not a dessert, it's and antidepressant) or buy shoes. Lately, I have been singing hymns to cheer me up. I love Four Peaches' shop, they have beautiful fabric and very reasonable prices. I receive their newsletter and follow on Pinterest. Read the bible and put on praise music....and pet my cat. I LIKED Four Peaches on Facebook. When I have the blues I pet all my dogs and much of my fabric. When I get the blues, I throw myself into a project like sewing or clean out a closet or cabinet. I need a focus that takes me out of myself. Pretty soon I am back to my ole Pollyanna self. First I eat! Then I read magazines and catalogs. I like to do something crafty-sewing, quilting, knitting, scrapbooking. I either cook or quilt when I have the blues. I love their Petal Lane fabric collection. It is so springy!!! I try to do something nice for someone else, by the time I put in the effort for them I always seem to feel better. I love the Blossoms and Spokes pattern on their site! Super cute! Sewing helps me beat the blues. Or playing with my new kittie! Doing something outdoors with my family chases the blues away for me. Down on the Farm is my favorite fabric collection at Four Peaches Fabric! Music helps a lot, but so does retail therapy at the LQS! I play with my grandkids, they always make me smile! I cheer myself up by sewing - helps me to get my thoughts on the right track. I follow Four Peaches on facebook and email. I talk to a friend, eat a bit of chocolate, and head to my local quilt shop. A good workout always improves my mood. And sewing does too, of course. I liked the Matilda bundle so well that I ordered it! Love that there is free shipping too. Wonderful shop. I follow 4 peaches on FB and IG. When I'm feeling down, I make sure to get outside and observe nature. The wonder of it all, always brings a smile to my face. I buy pretty fabric. Sometimes I eat something sweet. I take a walk and eat some chocolate. I get outside and do some work with flowers or just walk. I already follow them on Facebook. Love to see what's happening over there. I listen to music, and clean the house! I followed them on Facebook. Love the blues fabrics. I quilt next to my fire place with Andy Griffith on tv! 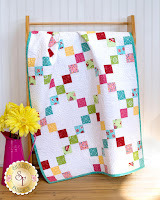 I visited Four Peaches and would love to try the Wonky Irish Chain by Melissa Corry of Happy Quilting. I eat chocolate and sew. I receive the Four Peaches newsletter and have already ordered from them! Love this shop! Spending time with my dog while taking a walk usually clears my head and gives me reason to count my blessings. Winter has seemed so long! I make cookies and watch TV. Sad, huh? Sewing definitely helps the blues....along with a 2 or 3 mile run. Play in my sewing room, it is definitely my happy place! I visited the website and made a purchase! Those bundles are very appealing! I had never visited the Four Peaches website....so glad I did! Not only did I sign up for their newsletter but I also placed an order of one of their Peach Blossoms fat quarter collections and 3 other fat quarters. Thanks for introducing me to Four Peaches Fabrics! I bundle up, grab a dog leash and go for a walk in the woods. Four Peaches has great bundles. I follow along on FB. I sew to cheer me up! I follow Four Peaches Fabric on Instagram and signed up for their newsletter. I go through my favorite fabrics!!! Thank you! Going into my studio always lightens my mood!! I love the bundles and the free downloads - I want to try the burpie pattern. I think of my mother, a German decent American woman. She would say "Do something, even if it's wrong." Then I get up and do something. Pretty fabrics. Reading a good book is a great help to get past the blues. Thanks for the referral! I just had to get an Orange You Happy bundle! Go shopping for fabric, or just go sew something. When I have the blues, I like to go for a walk and sing (loudly) until I feel better. saidWhen I have the blues, I find a book that I love and Read. I like the Little Sweetnesss fat quarter bundle on her site. I rarely have the blues, but when I do, I make myself do something: read a book, sew, take a walk, go shopping, anything that takes my mind off my problems. I'm following Four Peaches via email. I like to quilt when I have the blues! It relaxes me and brings a smile to my face. I found that just doing something - stitching, reading, wandering, dreaming, etc., it gets my mind off to something else will help me with the 'doldrums' - thanks. I receive emails from Four Peaches. I quilt when I am feeling blue, it brings a smile to my face and relaxes me. I follow Four Peaches Fabric on Pinterest. I pat (more like caress!) my fabrics and blues are my favourites. I go out for walk to clear my head. Chirping birds lift my spirits. When I'm feeling blue, I escape to my sewing room, put aside all my UFOs and start planning a brand new quilt! I get Four Peaches's newsletter. I sew to cheer myself up! I signed up for Four Peaches newsletter, and I purchased a fat quarter bundle. I go for a long walk with my puppy if I need to cheer myself up. The great outdoors always make me feel happy. I like to get in the car and just go to Target or Walmart or Michael's or Joann's and shop around, even if I don't need anything, or buy anything. Sometimes it's just nice to lose yourself looking at things that inspire you to be creative. My Jazzercise classes! It makes me feel good even when i feel bad. Exercise (a nice long walk in the woods) usually helps me feel better. I just downloaded the Four Peaches Giant Pineapple pattern. I also checked instagram (Four Peaches) and saw the sweet dog with the adorable expression!!! Fezzik! What a nice dog!! Subscribed to the Four Peaches newsletter. When I am blue I usually try to do something productive...sewing or cutting for my next project. I like to do something that has some immediate gratification. I have a cup of coffee or tea and a treat (cookie or piece of chocolate) and find a good book to read. I visited the shop--really like the orange and blue peaches bundles--and I signed up for the newsletter. I like to listen to my favorite music or watch one of my favorite movies when I am feeling the blues. When I have the blues, I look at old pics of my grands and all the good times we've had. Also digging in a little fabric can help! I follow Four Peaches on FB and Instagram. Getting out the house usually helps, or forcing myself to do something active. I follow Four Peaches on Pinterest. When I have the blues, the 2 things that can cheer me up are taking a walk (if the sun is out) & sewing or crafting! When I have the blues I wrap myself up in a quilt and call my daughter who always makes me laugh and feel better! I follow Four Peaches Fabric on Facebook. Living in Georgia we're all about the peaches! Lovely fabrics! 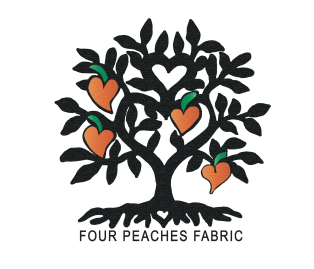 I get the Four Peaches Fabric newsletter. They are great! When I have the blues, I like to talk on the phone with my mom or old friends! I like the "Moose for Christmas" fat quarter bundle. I go for a walk to chase away the blues. And I follow Four Peaches on Instagram! I DO something. A walk, clean, cook, garden—anything productive makes me feel better. It’s tough to get going but I know the end result will make it worth it. I esp like the aqua and red (want to do a quilt with these colors) and the Down on the Farm (I have chickens!) bundles but all of their fabric is nice! I love the Sunshine Garden Fat Quarter Bundle. So pretty! Thanks! I make a cup of tea, light a fire, call my cat to come and snuggle with me and get lost in a good book. Thanks! When I feel blue I start straightening up my scraps and plan a new project. Just seeing all the pretty colors and prints makes me happy! Then I take a walk outside in my garden! Follow Tour Peaches Fabric on Facebook: Nicole Sender. I cure my blues with a glass of wine and planning my next craft venture. I LOVE the Aqua and Red...Quilt Making Ahead fat quarter/half yard bundle! What pretty fabrics! When I'm blue, I like looking through my fabrics, and it helps me remember all the stuff I want to make, or notions I want to try. That always cheers me up! Sunshine always cheers me up! In the summertime working in my garden also cheers me up as well. Right now just planning my garden is doing the trick!! When I’m blue or feeling down n out, I phone my daughter. She has a way to brighten my day. My best way to cheer up is to take a walk outdoors. It can sometimes be a struggle to get myself out the door, but being out in nature helps a lot. My second-best way is to craft something. Anything!